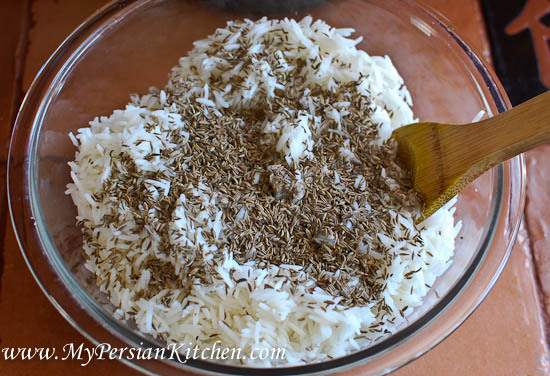 Persian rice with cumin seeds might come across a bit unusual to some. 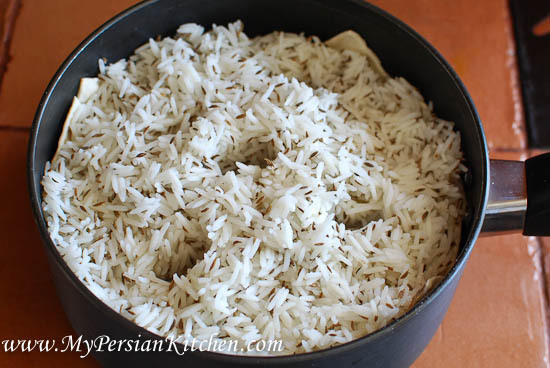 I was introduced to this polow, Persian mixed rice, during my teenage years. I promise you that if you like the taste of cumin, you’ll love it! It is ridiculously easy and it has been a personal favorite for many years. I really love the taste of cumin and often use it my cooking. I absolutely love to pair Zeereh Polow with Tass Kabob. I think they complement each other beautifully. I hope that you will enjoy this rice as much as I do! 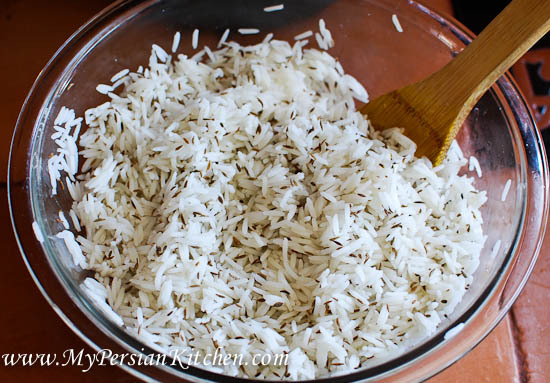 Parboil rice according to the Cooking Rice for Polow post. Toast cumin seeds for a few minutes until the aroma rises. Remove from flame and set aside. 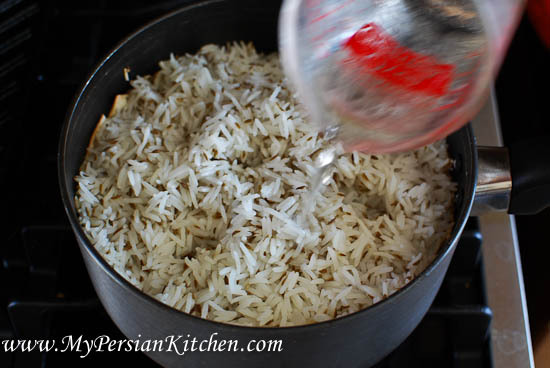 Once rice is ready and strained, place in a mixing bowl. 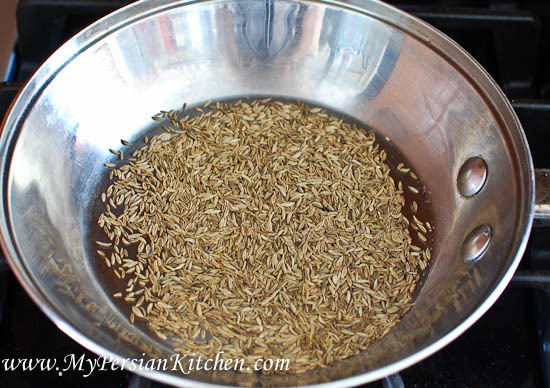 Add cumin seeds to the bowl. Gently mix well. 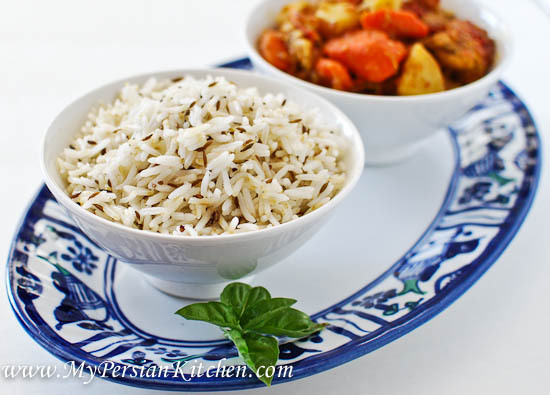 I have found that for this recipe it is best to simply mix the rice with cumin in a bowl, for even distribution, instead of mixing it the traditional way, which is in the pot itself. Add canola oil and 2 to 3 tablespoons of water to coat the bottom of a non-stick pot. Add rice on top and with the back of a spatula create 5 holes in the rice. Cook covered on high for 10 minutes. Mix 2 tablespoons of water with 1 tablespoon of canola oil. 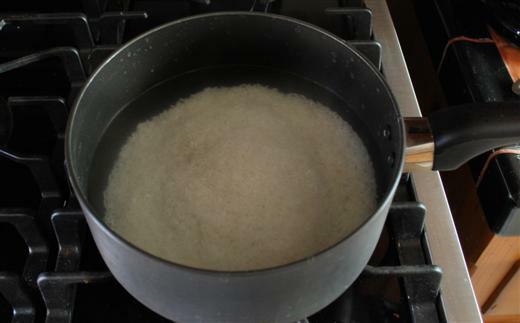 Pour mixture over the rice. Wrap lid in a towel, cover, and cook on low for 1 hour. Zeereh Polow can be served with Tass Kabob, Roasted Cornish Hens with Saffron, and Pan Fried Chicken With Persian Spices. interesting recipe…. i will have to try it!…..and i LOVE tas kabab. my zan amoo (who was from ahvaz) used to put zeereh in her maygoo polo. Maryam Khanoom, thank you so much for your recipe, a quick question, in the second picture, it shows like the cumin seeds are deep in oil, is that so? or I just roast them for a minute or two in a dry pan? Bobak, they are not in oil!! I simply toast them in a dry pan!